Prime Minister Manmohan Singh today directed the Cotton Corporation of India (CCI) to immediately resume its purchase and procurement operations of cotton in Punjab. Controversy over the mode of payment of bonus notwithstanding, Pungrain and Punsup have issued six lakh individual cheques to farmers for the just concluded paddy procurement season. The cheques have been routed through commission agents. It is perhaps for the first time that the government has decided to pay interest at the rate of 11.60 per cent from the date of procurement till date of payment of bonus. Though all cheques were issued before December 31, many farmers were still to get the cheques from their commission agents. Farmers today blocked the Markfed gate for three hours in protest against the state government not commissioning any state agency to buy cotton. 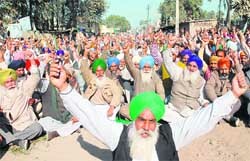 Cotton farmers protest in front of the Markfed office in Bathinda on Tuesday. Tribune photo: Malkiat Singh. The new Punjab Youth Congress dispensation, like the earlier one, is likely to vigorously support former Chief Minister and party campaign committee in charge Amarinder Singh. Recently elected state Youth Congress chief Ravneet Singh ‘Bittu’ has said the youth of the state felt Amarinder can provide an alternative to the Badal family. The Bahujan Samanj Party (BSP) has decided to go it alone in the coming parliamentary polls in Punjab. 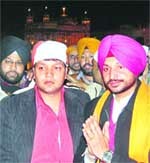 After paying obeisance at the Golden Temple here today, Punjab Youth Congress (PYC) president Ravneet Singh Bittu said he would try realise dreams of grandfather Beant Singh, former Chief Minister who sacrificed life for peace in the state. Canadian Federal Parliament member from British Columbia Sukh Dhaliwal today called on Punjab Co-operation Minister Capt. Kanwaljit Singh here and deliberated on various issues of bilateral interests, especially the need for more exchange in the fields of education, latest agri-techniques, agro processing, agro forestry, packaging and power sectors. Addressing a delegates session of the Punjab unit of the Janata Dal (U) here, national general secretary of the party Javed Raza criticised the SAD, one of the constituents of the NDA, for not providing any representation to the JD (U) after forming its government in the state. For those members of the central civil services, who are allotted other cadres, an assignment or posting in Punjab or Chandigarh is always welcome. “The right to information is a potent tool in the hands of the citizen to know what the government is doing,” said Maria Elena Perez-Jaen Z, commissioner for access to information and data protection, Mexico City. Maria was in the city to interact with the information commissioners at the Punjab State Information Commission here today. Residents and farmers in protest against the alleged forcible acquisition of more than 17 acres (on the Sangrur-Sunam road) by the Improvement Trust (IT) for the Mansahia Nagar scheme here, started a dharna led by the Zamin Bachao Sanghrsh Committee, Sangrur. They put up a tent along the Sangrur-Sunam road near the acquired land to continue the dharna till the scheme was scrapped. Even as the threat of procured grain rotting in the open storage spaces is looming large over the state, the Punjab government is now getting worried about where to store the wheat which is going to be procured in less that three months from now. 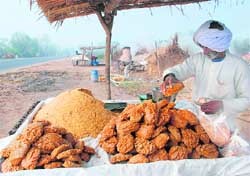 The Chunni-Landran road has become hub of jaggery (gur) market. Pure and clean jaggery sold on the roadside is attracting thousands of customers everyday. More than 12 makeshift units have come up along the road that make jaggery on the spot. Each unit uses upto 25 quintals of sugarcane on daily basis. Nearly 10,000 cards, under the National Rural Employment Guarantee Act (NREGA), have been prepared to give work for 100 days in a year to rural people in nine blocks of blocks of Sangrur district. These villages have been approved by the Union Ministry for Rural Development on the recommendations of the deputy commissioner. The work includes cleaning of ponds, drains, construction of retaining walls of ponds/drains, construction of streets and street drains in villages. Punjab Technical University (PTU) has decided to upgrade the syllabus of IT, management, pharmacy and hotel management courses to meet the needs of the market. Vice-chancellor Dr Rajnesh Arora said educational standards in respect of the varsity’s distance education centres would be observed. “We will not hesitate to close down the distance education centres lacking in faculty or infrastructure. Monitoring of these centres across the country was on,” asserted Dr Arora. 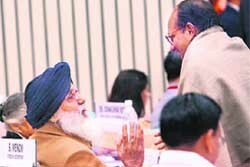 Dr Jaswinder Singh, agriculture development officer of Moga, has been selected for the state award for outstanding performance in creating an awareness among farmers of his area on the latest farming techniques and successfully organising a three-day state-level agro-mela here last month. Members of the Punjab Government Non-Gazetted and Gazetted Personnel Welfare Association here have demanded age of retirement be raised from 58 to 60 years. In a drive against corruption in public life, Punjab Vigilance Bureau arrested two gazzetted officers and 13 non-gazzetted officers in 14 different cases and was able to secure the conviction of two accused in two vigilance cases. After taking “murdered-man-alive” Jagseer Singh’s blood samples for DNA fingerprinting, the Ludhiana rural police is in a dilemma who to match the samples with as his parents have both absconded fearing police action.